From the historic marker: This Federal style house was begin in 1814 by Sarah Porter Hillhouse, who came to Washington in 1786 from Connecticut with her husband David. In 1801, David purchased the town’s first newspaper The Monitor, and when he died in 1803, Sarah became the first woman in Georgia to edit and publish a newspaper which she continued to run for more than a decade, along with the print shop her husband had established. Here she also printed the official records of the state legislature. Articles in The Monitor, which generally had a circulation of 700 to 800, give a vivid account of events of interest to the people of Washington in the early 1800’s. Mrs. Hillhouse’s other business interests included trading in land and commerce. Her letters provide an interesting insight to life in early Washington. She was a successful businesswoman at a time when women were seldom active outside the home, and she helped to build a frontier village into a thriving community. Sarah died in 1831. 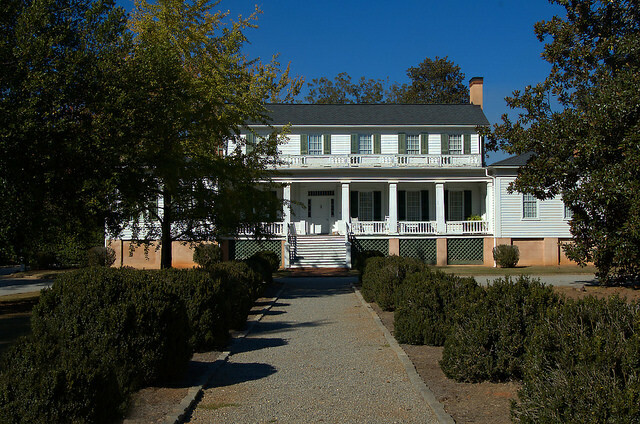 Her home was enlarged to its present form in 1869, when Gabriel Toombs (son of Confederate Secretary of State and brigadier general Robert Toombs) acquired the property, and moved the end rooms from the Toombs Plantation on log rollers and added them to the house. Toombs and his descendants lived here for more than a century. Hate to be pedantic, but I know you appreciate accuracy. The Gabriel “Gabe” Toombs house in Washington,Wilkes co., was the home of Robert Toombs’ brother, rather than son. He also owned the adjacent house to the right. Love your site, you do a fantastic job and I know so many people have enjoyed all your hard work!